“ I am breathing,” we say. In fact, there is only breathing. The “I” is not doing a thing. Breathing just happens. That is a question without an answer. It does not matter. It is an utterly meaningless question. I could come up with every single theory. I could come up with every single belief and every single concept to explain breathing, how it happens and how it begins… God could give you the “answer,” but still an “answer” is not what is important. That breathing exists. Acknowledge it. It is an experience. When we are aware of that experience, we could begin our “knowledge” about breathing. Knowing its length, its depth, its relaxing properties, as well as how emotions appear when there is a lack of flowing movement in our breathing. Isn’t that an amazing, divine being? Are you in awe of experiencing a body through senses, thoughts, emotions and feelings through this human experience? Are you in elation when you recognize the “I”? No? It is the same old thing to be aware of that stuff? We take for granted what it is, a wonderful experience. It is through this “falling in love with your divinity,” how there could be an appreciation of another. You are unique and so is that one. It is through appreciation of that divinity how a magical source of inspiration appears. Because it drives our life. It teaches us without a willingness to teach. It is no longer about following to become someone. It is no longer about the greed to “have it,” to “be it” just to feel important. Inspiration is the nutrition of the soul. Look at the Ocean. Isn’t that a source of inspiration? Isn’t that the moment when appreciation is born all by itself in a natural way? That appreciation is necessary to relate with everything in Life. “Being good” is no longer a moral duty or an obligation, because of a promise, a code of conduct or something external. That inspiration is natural, subtle, gentle. There is no effort or learning required. As our world of movement meets stillness, then stillness will appear, all by itself. It is at that point, when we meet Oneness. It is in that nonsensical phrase, full of grammatical errors where we could find the deepest meaning of Life. No need to look somewhere else. “In one of your write-ups you mentioned about J Krishnamurthi..I have read quite a lot of his works..and i always felt his underline “idea” has always been to be free from all the beliefs and then one can know truly about oneself. But I fail to understand, how can one do that…isn’t getting rid from the beliefs also a belief in itself? I agree that one should constantly question their beliefs and “work” on them, but how can one not have a belief? Avyakt7 is not saying that “intellectual understanding is bad.” No. Intellectual understanding is “good” for “another day at the office, honey…” type of scenario. 🙂 Intellectual understanding is “good” to get your certification in Cisco routers and to successfully complete a test in a school setting, etc. If we are trying to use our intellectual understanding to “get” what J. Krishnamurti is conveying, we will have a very vague idea, no matter how many of his books we read. Aristotle was a thinker. Voltaire was a thinker. Descartes was a thinker. A philosopher is a thinker…we cannot say the same for men who have experienced a different level of consciousness. “Thinking” is not the adequate word, for that thinking comes from “conditioning,” that is from the past. For example, whenever a person uses his intellectual ability to understand “God,” he will be like Epicurus. His philosophy departs from a preconceived idea of who “God” is. 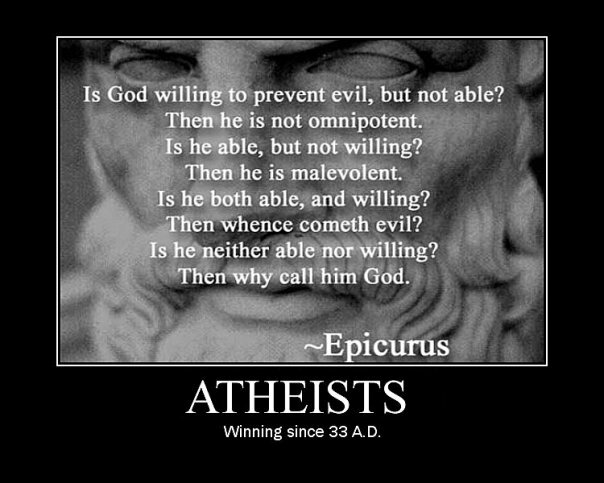 Atheists could jump in the “bandwagon” for Epicurus has demonstrated “logically” that there is no God needed. Epicurus have only negated his own definitions and ideas by using the game of words. God is not a definition. A definition is not the thing. That is the tricky aspect about relying in the logic and reasoning of intellectual understanding. What is the shortest path between point A and point B? Intellectually, we repeat. A straight line. Bravo! That conditioning works great. However, there are no straight lines in Nature. With the above little preface, we could go into your question. Let us try the Zen method for intellectuals. When Avyakt7 refers to “get rid of beliefs,” Avyakt7 is constrained by language. The simple but dangerous “black or white” understanding may arrive for some. “Pink pigs are able to fly.” It is a belief. If someone tells you: “NO…you are wrong.” How do you feel about it? Do you defend yourself? Now, that we understand the game of beliefs, we could go further to push our own beliefs. If you disagree with me, that is fine as long as that statement does not move you, that is as long as you don’t put your energy to defend yourself or your position. The issue with beliefs is not whether they are “right or wrong” that is debatable intellectual morality. The issue is to discover what moves you into some uncomfortable setting, something that gets you out of a peaceful self. Let us try another one. The opposite holds true. If you tell an atheist (someone who has labeled himself as “not believing in God”) that “God exists,” that person may strongly argue with you if he has identified with his beliefs. We shouldn’t forget that we are dealing with “perceptions of reality” and everyone is entitled to their beliefs. The problem is when we identify with them by REJECTING anything else. Because there is oneness in openness. If we reject a part of life, we reject ourselves. One more time, life is not interested in how “right or wrong” we are in our beliefs. That is of no consequence once we understand that we are dealing with perceptions. And if that doesn’t do the trick, then Avyakt7 will go back to the “Zen method” for intellectuals…. Any teaching that comes from insight is not to be taken intellectually. We could get lost in words, concepts and definitions by doing so. Paradoxes are beyond logic and reasoning. As our culture has become cluttered with intellectual information, most individuals believe that a “spiritual concept” is to be understood intellectually. Nothing further from the truth. Sadness. How could we explain what sadness is to a person? Most people have experienced sadness so it does not matter how I define it, there will be an understanding. Let us pretend that we don’t know what sadness is. Obviously the words above do not make any sense to little Jimmy, as he has to look up in the dictionary for every word used in the definition. Only that which he has experienced, he will recognize. That is why a Ph.D type of dissertation about sadness will not do a thing as far as “inner understanding.” It may be a source of great information with the latest research on sadness but that is about it. Intellectual information. On the other hand, if “Know-it” the poet; explains sadness to little Jimmy, he will give an analogy. “Sadness is like being in a bright day, full of sunshine…and deciding to turn your head back, towards your own shadow. If little Jimmy had the experience of his own shadow and a bright day, he will have an idea of what sadness is. That idea becomes the experience once he experiences sadness for himself. At that point little Jimmy will be sadness. To know is to be. This is why spirituality is more in tune with poetry than research. It is more in tune with feelings than thinking. How could you explain the notion of being in control but at the same time, being harmonious? Have you seen the 800 meter champ, David Rudisha from Kenia; run a race? It seems effortless movement. Balanced. Harmonious and yet fast and powerful. Rudisha maintains his poise, his form even while breaking the world record. The 800 meters is one of the most “painful” events in track and field, but he is able to keep his poise from beginning to end. Now, if we are able to “understand” that harmonious control by seeing the example, we could use that in our everyday movements. We could even exercise while keeping that harmonious balance. Form, style, balance. That is an art in itself. In Spirituality, we mirror beauty. Every aspect that we could be aware of is an opportunity to “be it” again. It is a matter of recognition. That is how we “learn.” We just recognize it, if our awareness is “on.” Otherwise, we could be lost in the world of definitions, concepts and logic, the world of meaningless words. When a human being deviates from the common good, then different rationalizations will arise to protect his own perceived individuality. Mr. A wants to get more out of life by “having more” than anyone else. Mr. A has the right to “have more.” Note that the whole mental idea of a prosperous society is to “have more” of anything. Obviously, to “win” is everything and that “winning” could be interpreted as being “better,” not being a “loser,” and since that is the motive, the purpose of our existence, then our behavior to procure that “win, win” may deviate from the Totality. Trying to win 1 million dollars or to win Paradise is the same ego centered thing. 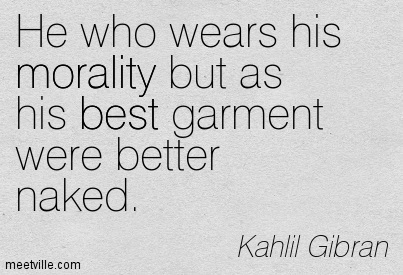 That is how manipulation and interpretation of those moral standards have changed throughout human history. Then, to perform certain activities was considered to be the “culprit” of insensible human behavior, so “do not’s” appeared as moral patterns to follow and praise and with that a rigid mind appeared, thinking that something is “good” because it is the law or the moral standard of the time. Our lives became “mental” and we got separated from empathizing and feeling life as part of the whole thing. There is the sign by the lake: “Do not swim.” We see someone drowning and we may be good swimmers, as a matter of fact, the individual drowning is not far away… Do you jump in and save the person or not? If you don’t, you may be following the “law.” Intellectually, you have done the right thing! Your heart may tell you a different story, but nothing that you could not “drown” inside yourself by trying to forget about it! If we become too mental, too brainy about acting, we could never act in a “good way.” All we could do is to follow a script, which is not what we feel. Many religions and societies are in favor of scripts, and laws. Being “right,” means doing what is “right” according to some standard. For someone who is in tune with his own feelings and who is sensible to beauty, that sensibility becomes the law. Not touching a prostitute to help her to cross the river is the law for some. To feel the beauty of empathizing and feeling for others, is the heart, the core of an action. Many are so caught up with particular actions by calling them “good or bad,” and forget the heart of those activities; that is what I feel beyond my individuality. To become sensible to beauty is something that many have lost. This is not only physical beauty but the surroundings, the vibrations, the setting and what we could bring into it. To feel beauty is not related with seeing it… although that beauty could be enjoyed through the eyes as well. 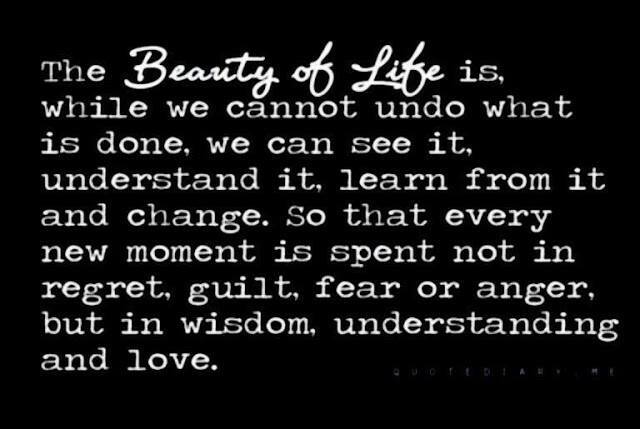 Life is way more than rigid systems created by the mind. Life is more than a book with commandments. When we learn to be part of the Totality, the whole; then mental rigidity is out of the question. Many are so busy teaching others about the “law of God,” forgetting about becoming sensible to beauty and the law of your own heart. The unspoken truth of your feelings in connection with all. Because our lives are boxed in a mental cage and we cannot truly increase our capacity for enjoyment in life and fullness when our mind jumps from one place into another. This “normal” phenomena of the modern human being, cancels our feelings, which are of paramount importance to enjoy life. In reality there is nothing to “conquer,” but the term “conquering” is used to denote that the mind will no longer “run the show” in our lives. That is a great transformation in itself. When the mind runs in an altered state, or non-stop, it is able to take over and affect our body with stress and anxiety and distort our perception of life. For example: Do you recall how your last breakfast took place? Let us say that you need to go to work after eating. See how the mind sends a message to “hurry up” not allowing us to fully enjoy our meal, or while we are eating and tasting the food, another thought comes up which does not allow for the full experience of eating, to take place. The mind is full with pre-conceptions, beliefs, taboos, and judgments and will not allow us to feel a healthy “emptiness,” from all of that. 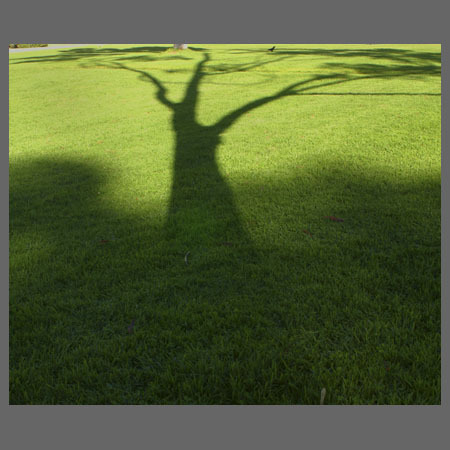 A break of “nothingness.” That emptiness is very important for newness to occur in our lives. Otherwise, it is the same old thing under a different perspective. The mind needs to be observed so we can catch how it operates and learn from it. Then, we may increase our capacity for enjoyment and appreciation of life; that is our feelings. For instance, love to God is what many religions use as a way to overcome the heaviness of the mind by using feelings. However many times those feelings are mixed with fear. When there is fear there is no love and no feelings. An empty mind is necessary to be able to decorate that empty space with something new. Otherwise we are just adding and crowding the space with additional information. For example, if someone wants to add “tolerance” in their lives; many will define in their minds what is “tolerance” and will act it out whenever they remember it. All of that is mental information. Nothing will sink in unless the mind has been emptied from preconceptions and the being is open and accepting to the different scenes which life may bring. For example, a family may have a dog. The son “thinks” that he loves the dog but doesn’t take care of its needs and does not clean up after that dog. The mother is tired of that dog. The dog senses the environment and becomes adversarial. The mother poisons the dog since getting rid of it through another person will hurt the son’s feelings. The son is hurt anyway and blames a neighbor for poisoning his dog. The mother tells a friend about this incident. What the friend could say? Whatever the friend says will only show what is in his mind. There are some friends who will side with the mother. Other friends who could find wrong in her actions based on some moral standard. Those are the activities of the mind. When feelings are operating, a friend could listen and feel. That empathy with someone’s suffering is enough, when there are true feelings of compassion. This is not a “learned” mental action such as giving someone a verbal teaching or making that person feel worse than what she feels. That openness to feel and accept the role of others does not come from a mental space, but from a heart without self-created mind barriers. That is more than what tolerance could be. It is called love… and that cannot come from the mind and its concepts, logic and definitions. A Lotus flower needs mud to live. To say that a Lotus flower is “pure” because it rises over mud; is to forget that there is an interdependency between that flower and mud. That beauty is there because of the existence of murkiness. Similarly with human beings, we could concentrate on finding their darker side, their vices, and their impurities… completely overlooking the beauty of the lotus flower, which is beyond the existence of mud. If we only look for mud around us, we will find it by overlooking the flower. If we only look for a flower, we can easily overlook the mud. That is our “choice” of vision in life. Looking for the flower inside us opens the world of beauty, the world of appreciation. Why concentrate in our vices, our impurities when our vision could have the colors of beauty? Spirituality is the search for inner grace and refinement. That charm in character. That alluring touch of class… A wholesome personality… blossoming beauty! The above is not a religious pose, a “saintly” behavior or a well-trained monkey taught to smile to collect a few coins. When that inner beauty hasn’t been found, then fake responses will be in abundance. We cannot fake the beauty of a flower, but we can hide it. We could unwillingly cover it up with the illusions of our own minds, ill spoken words or dishonest behavior. That is we could only see mud… and lose the flower. The colors of a rainbow are fully appreciated after a heavy rain. 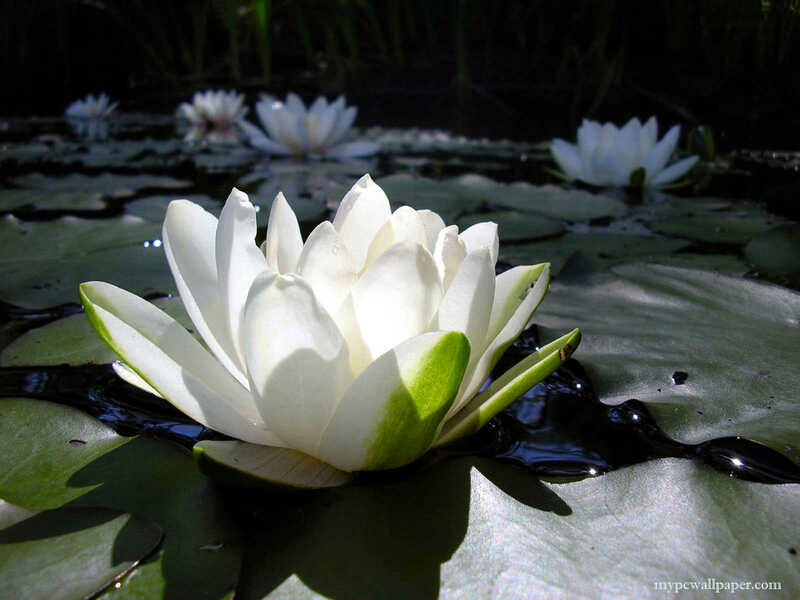 Greater amount of mud means, greater appreciation of the beauty of a Lotus flower. Life will place people in different circumstances and in different roles. Those roles may be of a “hero,” or a “villain;” nevertheless, a flower remains a flower despite circumstances and roles. A flower residing in mud, in pebbles and stones or in a forgotten pot in a far away corner… is still a flower. The only difference is in self-recognition. Do I see myself as who I am; a flower, or I just “act,” as a flower? In that acting is how we easily become a weed and lose the flower.